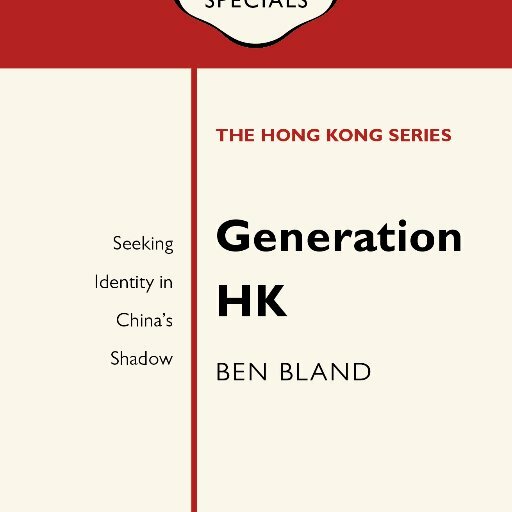 It is that unadulterated objectivity and his unquenched curiosity that make Generation HK: Seeking Identity in China’s Shadow a discerning and refreshing read. 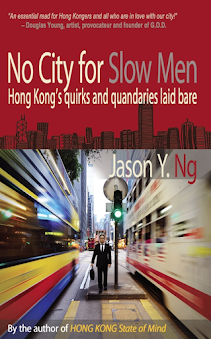 Released last summer under Penguin Book’s inaugural “Hong Kong series” to mark the 20th anniversary of the handover, the book zeroes in on the demographic that came of age in the two decades since the city’s return to Chinese rule. It profiles six groups of young men and women who began from vastly different starting points in life and chosen vastly different paths for themselves to get to vastly different finishing lines. Yet their challenges are similar: they must negotiate their way through a Fragrant Harbour muddied by limited upward mobility, skyrocketing property prices, simmering cross-border tensions and the ever-tightening grip of the Chinese government on every aspect of civil society. 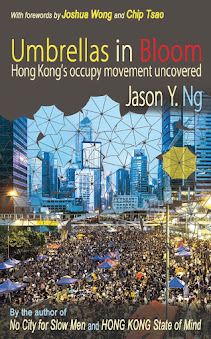 It is apt that the book begins with Joshua Wong, Nathan Law and Agnes Chow—student leaders of the Umbrella Movement and founding members of a new political party called Demosistō. The Yakult-drinking, brownie-munching and iPhone-thumbing trio shared their motivation for risking prison and personal safety to stand on the frontlines of the city’s pro-democracy battle against China. Bland’s conversations with them are honest, quirky and straight to the point. “A lot of people think we don’t know China, so we hate them,” Law tells Bland. “Actually, we know China, so that’s why we hate them.” Those simple words have taken on new meaning after Law and Wong were recently thrown into jail for unlawful assembly thanks to the Department of Justice’s appeal for harsher sentences. The DOJ’s decision is widely seen as a political move to pursue legal action against prominent activists at the behest of Beijing. Bland’s many-coloured coming-of-age story continues, as he turns his focus to a menagerie of young characters: a pair of financially successful but morally agnostic star tutors, a trio of professionals who earn their keep by day and dabble in local politics by night and a group of artists who create under growing state censorship and commercial self-censorship. 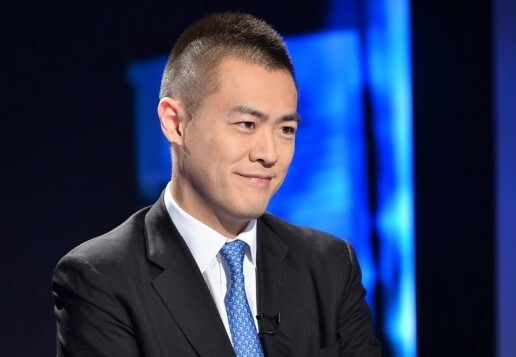 Not surprisingly, the only young tycoon who is willing to speak to a foreign correspondent is Lau Ming-wai (劉鳴煒), the camera-ready heir to one of the city’s largest property developers. Nevertheless, readers hoping Lau will shine a rare light on how a fuerdai feels about the city’s existential angst will be disappointed, for the thirty-something New York-qualified attorney is a one-man public relations machine. Lau fields Bland’s questions with practiced savviness and polished rhetoric, making the interview read less like a candid dialogue on identity than the scripted monologue of a nakedly ambitious politician-in-waiting. Generation HK ends with student leaders from the fledgling pro-independence camp: Edward Leung (梁天琦), Chan Ho-tin (陳浩天) and Baggio Leung (梁頌恆). Defiant, brash and all-talk-and-little-action, the three are a facsimile of the radicalised youth emerging from the Umbrella Movement. 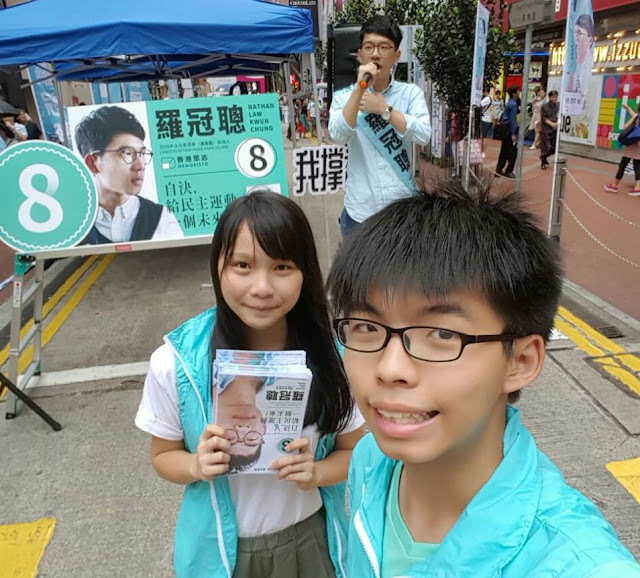 “A Hong Kong nation is growing in the minds of many young people. 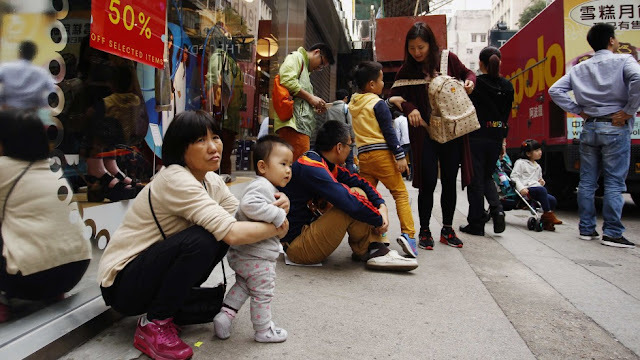 But no one has a realistic plan to bring [an independent Hong Kong] nation to life,” Bland accurately concludes after speaking with the seditionists. While the push for independence is far-fetched, the frustrations that underlie it are not. “We like [to win]. It’s in our DNA. But now we’re losing. 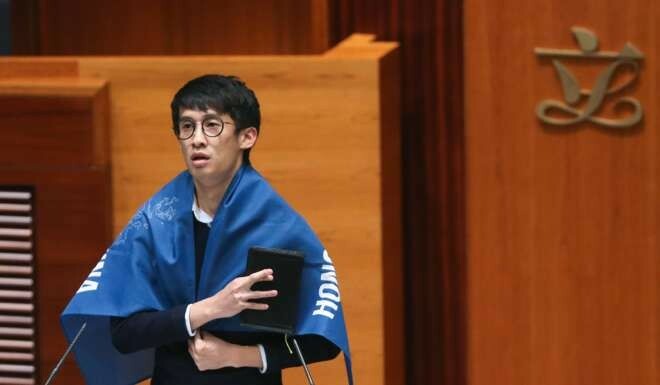 Hong Kong is not Hong Kong anymore,” Baggio Leung tells Bland at one point. No keen observer of Hong Kong’s political landscape will disagree with that sentiment. The book invites comparison to Alec Ash’s Wish Lantern: Young Lives in New China (Macmillan, 2016), which looks at another fast-changing society through the eyes of a half-dozen youngsters. Both works offer a small window on a big issue, using the story of some to lay bare a struggle for all. 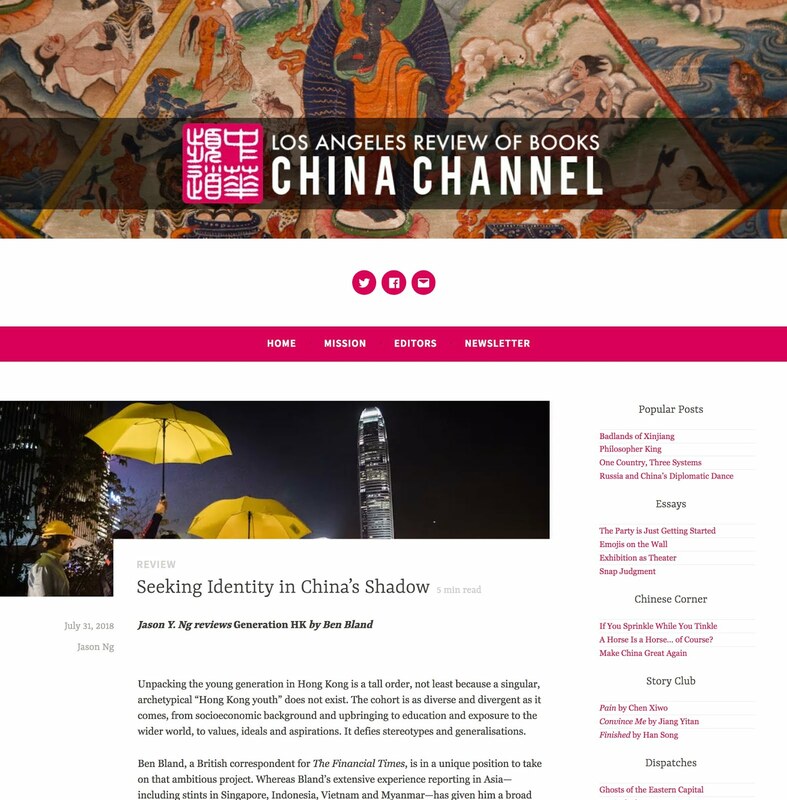 Baggio Leung, draped in a banner declaring "Hong Kong is not China"
This review was published in Issue 28 (December 2017) of Cha: An Asian Literary Journal, and in the Los Angeles Review of Books China Channel.